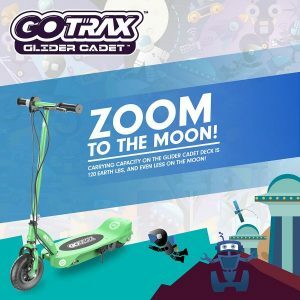 Designed and produced by GoTrax, the Glider Cadet electric scooter is relatively new to the market but is a strong contender for best electric scooter for kids for 2018. It features a smaller frame and deck, making it a perfect option for kids aged 8 years and above. The GoTrax Glider Cadet can support a weight capacity of up to 120lb. It is powered by a 100W electric motor and can reach speeds of up to 11mph for a distance of more than 7 miles. Overall, the Glider Cadet is a well-made scooter. The frame is constructed from steel and built to last a lifetime, ensuring fun for many riders to come. An 8-inch pneumatic front tire ensures a smooth ride, while the lever activated front brake keeps things in order. There are no clunky battery cases or loose wires. 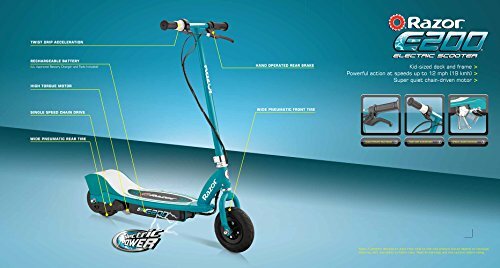 To get the scooter rolling, power is available through an easy, intuitive twist grip throttle. Using the fear shaft mechanism, the power is delivered to the wheels providing a good amount of torque. After engaging the engine, it will take a 120 pounds ride up to a brisk speed of 11 mph. A single charge can take you more than 7 miles. However, you can consider pushing the scooter, to extend the battery. The unit is lightweight, making it easy to transport. To enhance safety and performance, the Glider Cadet e-scooter uses a 24v lead acid battery that is easy to recharge. You do not have to be an expert to navigate on this electric scooter. The adjustable handles provide a simple control system that doesn’t require expert balance. You can access brakes from two locations: on one of the handlebars and by your back foot. Since the handlebars naturally act as the center of balance, you can easily jump off the scooter in case you run into trouble. The scooter comes in five cosmic colors, including Neptune Blue, Planetary Purple, Alien Green, Pulsar Pink and Mars Red. This means that you will certainly find a color your child will love! The brand isn’t as well known as Razor, being relatively new to the market, however its already taking off and has proven itself as a provider of well designed, high quality and safe electric rideables. The Razor E100 Electric Scooter is perfect for kids aged at least 8 years. However, since kids grow at different rates, some 6-7 olds can easily manage the E100. The scooter needs a 3 mph push before the rider fires up its motor through twisting the throttle. After this safe start, the rider can then accelerate at a top speed of up to 10 mph, which is perfect enough for fun, yet safe for a pre-teen kid. For enhanced safety, ensure that your child wears an approved scooter helmet while using the E100. Its throttle control is on the right hand grip. It applies a twisted motion to reduce or increase the scooter’s speed. To stop the scooter, the rider needs to first release pressure on the throttle before embarking on the brakes. The scooter is fitted with a manual rear braking system in case of an emergency, speed reduction or need to stop. This enhances the safety of the rider. Moreover, the manual rear braking system ensures precise functionality. Its battery can run for at least 40 minutes before it can be charged. This means that your kid can roam with the scooter for 5 miles before recharging. Its recharging procedure is simple. It just requires you to attach a charge cable to a charging port fixed underneath the scooter then plug the cable into a power outlet. Though 12 hours are enough, it is recommended that the scooter should be charged for 24 hours for more battery life. The Razor E-100 electric scooter is made with a steel frame and fork that is powder coated. The frame is available in three colors: purple, pink or red. Its front fork harbors 8” pneumatic rubber tire. Its rear wheel is manufactured from polyurethane material and fixed below the scooter’s safety guard for powering by chain. The E100 Scooter requires some minor assembly e.g. the handlebar must be attached to the base unit. For easy storage, you can fold the scooter’s handlebar once your child is through with it for the day. You can also de-assemble it into two parts for easy transport. The brake isn’t as effective as it could be, especially if used when going down a slope. The Razor Power Core E90 Electric Scooter is perfect for kids aged between 8 and 16 years. It weighs 22 pounds and can support a weight of up to 120 pounds. Made through a new power core design and technology, this upgraded scooter has double ride time and 50% greater power than its predecessor, Razor E90. 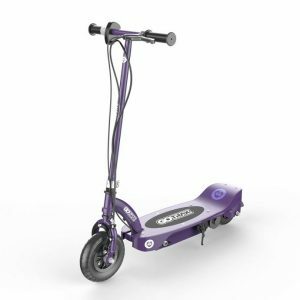 The e-scooter boasts a chain drive motor of high torque that works hand in hand with a kick-stand. This enables your child to choose either to zoom along under electric power or to push- ride. The high torque motor enables the scooter to run up to 10 miles per hour. The motor is usually started through a push button throttle. Though the first acceleration is fast, the scooter requires a kick-start before it starts moving. The kick-start allows your kid to have perfect control while starting the scooter. It has a very powerful 12V sealed lead battery. Your kid can enjoy up to 80 miles ride time with just a single battery charge. The battery takes 6-8 hours of charging. However, the manufacturer recommends a 12 hours charging duration. This promotes a more battery power retention capacity and long lasting properties. Charging is simple since it only requires a standard household power outlet and a Recharging cable. 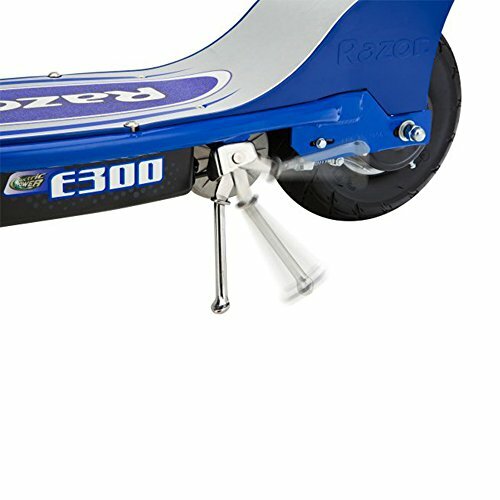 The front fender brake of the Razor E90 Scooter is hand operated to allow for smooth stopping power. Its real wheel brake, which is pressure sensitive, offers your kid a gradual slowing for safety. However, before applying the brakes, it is recommended that your kid should release the accelerating throttle and start slowing down naturally. The scooter’s rear (airless to enhance a smooth ride) and front tires are manufactured from a long lasting urethane material. This ensures a quiet ride regardless of whether your kid is indoors or outdoors. Moreover, this scooter is made in a design that makes ideal to ride over both smooth and slightly rough surfaces such as concrete and asphalt. E90 scooter is made with an all- steel frame. This makes the scooter strong and long lasting. Furthermore, the steel frame is not subject to breaking in case of an accidental fall. The scooter’s forks hold its wheels firmly. It offers precise support to the real wheel since there is no chain. Absence of a chain means that no chain tensioner or aligner is needed. Maintaining your child’s scooter therefore becomes less costly. A retractable stand is comes with the scooter. This enables your child to prop the scooter up, eliminating the essence of holding it up. 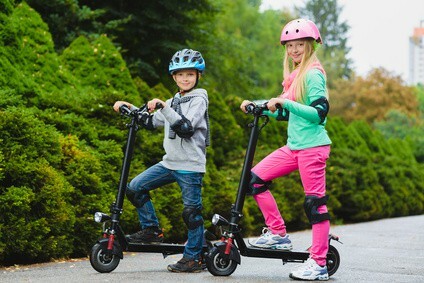 Being a successor of the original Razor E90 electric scooter, new Power Core electric scoter has been designed with outstanding features to make sure that your kids enjoy their rides. It is price friendly and currently available on market as one of the best electric scooters for kids. The Razor E125 Electric Scooter is designed specifically for kids aged 8 and above. This scooter is a successor of the Razor E100 Electric Scooter. It enables you to ride around the neighborhood while trying to implement your newly learnt riding skills. With a speed of 10 mph, this scooter enables you to practice all your riding tricks. It comes with a guide that enables new learners to ride it easily. The scooter comes in a variety of colors mostly red, black and silver, with a weight of 125 pounds. This electric scooter is made with a 125-watt variable speed motor. The motor enables the scooter to run at a speed of 10 Mph. You can comfortably and easily control your riding speed using the scooter’s twist grip throttle. The throttle is used as an accelerator, to increase or reduce your scooter’s speed. It is also very helpful when you are braking. The scooter has a hand-operated braking system. This makes the scooter simple to learn and ride by both new users and those already used, since many of them find it easier to use than foot-based braking systems. The braking system works hand in hand with the accelerator (throttle). They are both very crucial while slowing down or stopping. You only need to reduce your riding speed using the throttle then apply brakes. Razor E125 Scooter comes with a durable and rechargeable 12-volt lead acid battery that lasts for up to 40 minutes before a recharge. You can therefore cruise with your scooter for 5 miles before you recharge the battery. The battery charges for about 8 hours, though it is recommendable that you charge it for a longer duration for durability. The scooter comes with a battery charger and two 12-volt lead acid batteries. It is made with a handlebar that can be adjusted to meet the riding needs of users with different heights. This handlebar adjustability makes the scooter easy to store and transport, such that you don’t require a big space to keep your scooter while not in use. The front tire of the E125 scooter is pneumatic and eight inches in diameter. This guarantees a smooth and comfortable ride. The real wheel is made from polyurethane material. This enhances its strength and durability. The wheel has a diameter of 125 mm. It takes a very short time to assemble this scooter since you only need to follow the manual assemble manual that comes with it. As one of the best electric scooters on market today, it has many various features that give you a comfortable ride whether indoors or outdoors. With its wide availability, you can drop to any shop dealing with electric scooters to get yourself one. Razor E200 Electric Scooter is a modified version of Razor E100 Electric Scooter. Physically, it measures 37 by 16 by 42 inches, length width and height respectively. It weighs 40 pounds .Due to its large size; it is recommended for those aged 13 and older but weighing less than 154 pounds. The scooter is made with a steel frame and fork. This makes it very durable and unlikely to break in case of an accidental fall. The forks holds its front and rear tires. The tires are pneumatic and 8 inches in diameter. This gives your scooter maximum stability while offering you a comfortable and smooth ride. It has an electric motor that is chain driven and high torque. The highly performing motor enables your scooter to run at a speed of 12 miles per hour and at the same time maintaining a low level sound. This results to a quiet ride whether indoors or cruising in the neighborhood. Furthermore, this speed is quite safe for teens since it cannot easily lead to accidents. The E200 electric scooter is powered by two 12 volt batteries that are rechargeable. The batteries come with the scooter. It takes 12 to 24 hours to recharge. Once charged, you can cruise for about 40 minutes before another recharge. For battery durability, it is recommended that you refrain from disconnecting the battery from a power outlet before it is fully charged. The scooter comes with a rear braking system that is hand operated on the handle bar. With the scooter’s throttle also positioned at the handle bar, you can easily and comfortably control its speed since the two work hand in hand. The throttle, also the accelerator, enables you to reduce your riding speed before applying the brakes via your hand. You can easily fold your scooter’s handlebar for both storage and transport purposes. This means that you don’t have any difficulty storing the scooter in your house or car. The handlebar is also adjustable, thus height does not limit you from using this wonderful scooter. This scooter comes with all necessary tools to help you assemble and begin your rides. Tools such as a UL battery charger, tools to fix tires and a spring kick-stand to prop your scooter while not in use are included. It takes a very short time to assemble the scooter such that in no time, you will be enjoying your rides in the neighborhood! Not only is the Razor E200 Electric Scooter a perfect choice for cruising, but also a source of fun for you or your kids. Its high performance, durability and environmental friendly characteristics are enough to make you say YES to this wonderful scooter. The Razor E300 Electric Scooter is an improved version of the Razor E200 electric scooter. It is the biggest, most adult-friendly scooter in the basic Razor electric scooters. The E300 is an extremely stylish and durable E-scooter that is made exclusively for older kids aged above 13 years. It measures 41 inches in length, 42 inches in height and 17 inches in width, and weighs 49.5 pounds. The larger size makes it ideal for older kids and adult riders weighing not more than 220 pounds. To ensure fast and easy assembling, the tools of this e-scooter are enclosed in a package. It can be readied in just a few minutes under adult supervision. The Razor E300 Electric Scooter features a broad deck and a strong steel frame for enhanced safety and stability during transit. Its high torque, chain driven motor allows it to attain top speeds while maintaining a low level of sounds. The maximum speed of this e-scooter is 15 mph. The E300 is powered by two 12 volts rechargeable batteries and it comes bundled with a UL approved battery charge. When fully charged, the battery can provide up to 40 minutes of continuous riding. Before using the vehicle for the first time, it is recommendable that you charge the battery for 12 hours. Additionally, you should always charge the battery after every ride for about 12 to 24 hours. For added stability, the e-scooter is supported by a 10-inch pneumatic front and back tires. The bottom area encloses a spring loaded kickstand for easy parking. The speed of the vehicle is easily controlled by a hand-operated rear brake. The E-300 e-scooter is very easy to operate. All the rider needs to do is press the power button and then twist the throttle with both hands to get scooter moving. Unlike the earlier version, one does not have to kick start the scooter to get it moving. To stop the vehicle, the rider should let go the throttle and exert force on the brake until the scooter stops. The braking system is conveniently located on the handlebars. After the stopped, the rider can use the retractable kickstand to support the scooter. The handlebar is made foldable for easy storage. The scooter can be accommodated with the least available space. When compared to other Razor Electric scooters, the E300 is heavier as it is designed for older kids and adults. It is made to provide a comfortable riding experience. The Razor E3000 comes with a 90-day limited manufacturer warranty. Long charging time. You need to charge the battery between 12 to 24 hours before you can use it. The Razor E300 E-Scooter has received many positive customer reviews. This e-scooter is perfect for kids who want more speed in their ride. The battery life is good while the motor offers speeds up to 13mph. The e-scooter is very stable, reliable and great fun to ride for older kids. Some parents understandably have concerns about letting their kids ride electric scooters. The truth is that kids almost go as fast on their kick scooters and bikes as they would on electric scooters. 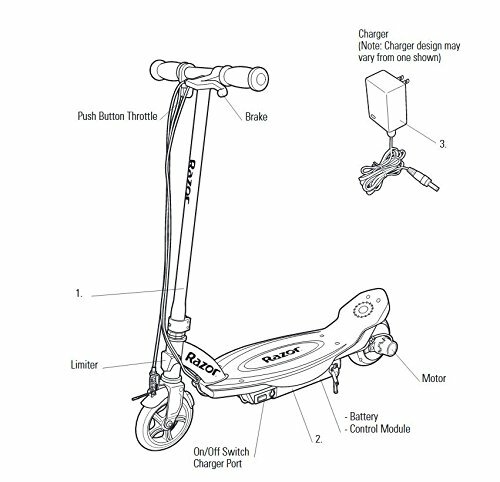 The above 6 best electric scooters for kids are proven to be safe as long as they’re used according to the manufacturers instructions. 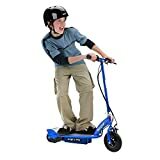 An electric scooter is most kids most memorable (and most used!) gift as a child, so its well worth investing in a good quality one. The good news is that most of the best electric scooters for kids are relatively inexpensive and with proper use can last a long time. Sites like Amazon.com and Walmart are popular marketplaces for electric scooters as they usually offer FREE shipping, easy returns, and you can read the user reviews before you buy.